Ace is back and he told you so! Uhhhhh... Haven't we heard that one before? Haven't we said that one before? I'm pretty sure we have. And we've heard this album before, too. 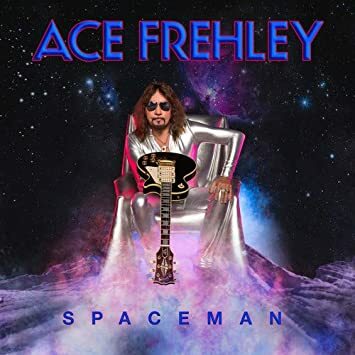 There isn't anything here that is revelatory or groundbreaking, but this is Ace Frehley we're talking about, so that's par for the course. What is of interest is the quality of the songwriting within those usual parameters, and the quality of the musical performances (and maybe the audio production as well). As for the rest of the album, it's nothing special, but nothing horrible either. It's mediocrity given an audio soundtrack, more or less. Songs like, "Rockin' With The Boys," "Bronx Boy," and, "Pursuit of Rock and Roll," are paint by the numbers Hard Rock songs in the Frehley style. Then you've got the heavier, almost Punky, "Mission To Mars," that again features an odd guitar tone (this time just too much fuzz and not enough crunch and definition). The song is OK, one of the better tracks on the album (which was co-written with several other writers), but is still nothing great. "Off My Back," just drags. It's got a weak guitar tone (light distortion, almost clean), and the song is as bland as the guitar tone. Add to the album an odd cover song choice in Eddie Money's, "I Wanna Go Back," and you've got a truly forgettable album. An album which closes with yet another instrumental (like many of Ace's albums) in the Fractured style, "Quantum Flux." This one is actually fairly good (this one showing his Led Zeppelin influences), and showed a higher level of effort and creativity from Ace than the rest of the album. Ace is in the same place that Ted Nugent's in - in his comfort zone on cruise control. Minimal effort was put in to the songwriting, and it shows. A real producer would have been a huge asset to this album as half the tracks would have been dumped, and the other half reworked into something stronger, but Ace isn't interested in working with a real producer at this point. That would be outside his comfort zone and would require him to turn off the cruise control.